Some people are just not animal lovers.. I can understand that.. sort of... in any case- our fair weather neighbour has returned to her "summer house" for the next few months. She believes that in order to stop Morley from barking at her - she must spray him with the hose... You can imagine my face when I watched her do just that this morning- standing in her housecoat- watering her flowers- turns and sprays Morley who is now barking at her posturing with the hose!! Many fabulous family weekends were enjoyed at our little cabin in Johnson's Harbour near Owen Sound. The family would gather round for fun and games, great food, good times, fab music and best of all wonderful memories. So, it's with trepidation we sell our weekend get away. The sunset sets just off the waterside of our boat house. The pinks & yellows glisten off the water. Rosie the Grosbeak shows up at the bird feeder looking for a fill up. The jays and cardinals sing away in the cedars. Alvin the chipmunk races around trying not to be in anyone's way. Check out link above. Look thru all the pictures and just imagine yourself and family enjoying horseshoes, croquet and a feast of freshly caught bass. Just a land line phone to connect you to the outside world. Once you arrive @ Johnson's Harbour you step back in time to a quiet place on the bay. 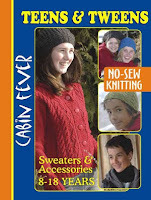 Cabin Fever's new book is just out... It will be coming shortly to Grey Heron. This has always been a difficult size range to find great patterns for. I can't wait to have it on our shelves. Have you heard about Bbelts?? We are carrying this fabulous "Canadian" line of belts... no worries about- what size you need... as you can see just add a beautiful scarf and voila!! It's the perfect accessory for all year round use..
From black, chocolate, pecan, red you're not missing any classic colour. As for scarves- we carry a full range of prints. Check out these little footies. Brenda made these up last week using 15gms of a 50gm ball of Regia. They are just cute as a button!! 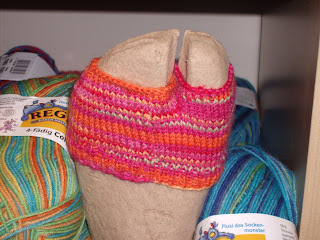 The pattern is a free download from the Regia website so you can get a copy for your files. all for $8.90 per ball.